The Custom Harley Fatboy is a "zebra" fat boy motorcycle has has been lowered and features a unique paint job. 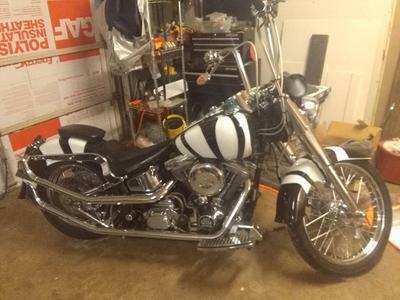 The custom Harley Fatboy for sale has a mild cam, fishtail exhaust, apes and six gallon cans. contact me using the comment form below provided by GoGoCycles Used Motorcycles for Sale.